Social and emotional skills are the most important areas in which preschool-aged children develop. 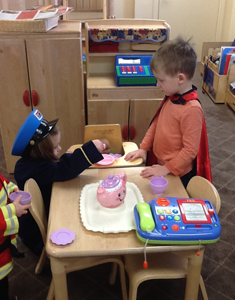 Children demonstrate a strong and positive self-concept, appropriate self-control, and growth in their awareness of their responsibilities when interacting with others. Language development and communication occurs as the children develop skills in listening and expressing their thoughts and ideas. This is accomplished through verbal and non-verbal conversations, play, and during daily activities. 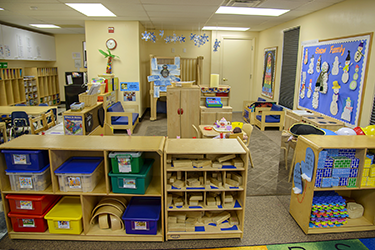 Writing center, stories, finger plays, poems, music, listening center, and puppetry encourage this development. 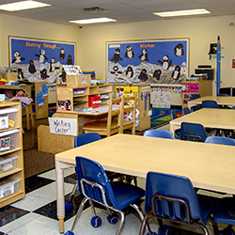 Literacy development emerges through a print rich environment. Exploring print in books, poems, songs, and begin to write and recognize letters in their name will help the child to understand that writing carries a message. 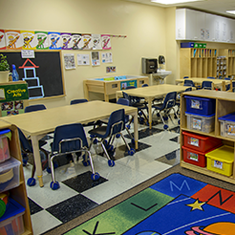 Mathematic development includes an understanding of number concepts, patterns and relationships, geometry and spatial sense, measurement, data collection, organization, and representation. This is accomplished through theme related activates. Science development occurs as children engage in play to discover, question, and understand the natural and physical world. Usage of scientific tools, five senses, observations, gathering and recording information, and making predictions based on real life experiences develop an understanding of the scientific method. Creative development occurs in individual and small group activities that use a variety of tools, art forms, and media to express their ideas and creativity. Appreciation of the arts is developed through various artist creations, techniques and culture. Physical health and development strengthen large and small muscles using sensory experience and practicing healthy behavior. 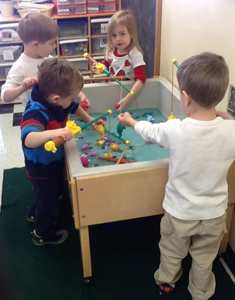 A variety of manipulatives and writing materials promote hand/eye coordination and fine motor skills. Playground equipment, music and movement activities strengthen balance, coordination and large muscle control. Daily routine increases self help skills while promoting personal health and safety.